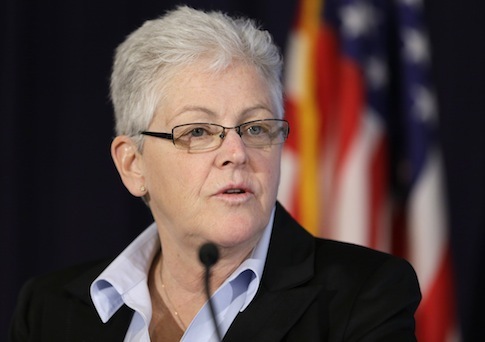 Republican senators on Thursday boycotted a vote to move forward the confirmation of Gina McCarthy, who has been tapped by President Barack Obama to head the Environmental Protection Agency. All eight GOP members of the Senate Committee on the Environment and Public Works announced early Thursday morning that they would not attend a scheduled 9:15 a.m. vote on McCarthy. Lacking a quorum, the committee was unable to proceed on a vote to advance McCarthy’s nomination. The move infuriated Democrats. "We call on Republicans in the Senate to stop gumming up the works when it comes to the confirmation process," White House press secretary Jay Carney said of EPA nomination. "Gina McCarthy is going to become the poster child of their obstructionism," said Sen. Barbara Boxer (D., Calif.). "Gina McCarthy is a woman who deserves this promotion." "We invite them back to do their job," Boxer said shortly before adjourning the meeting. "Maybe some of them slept in this morning, maybe it was a little early for them to get up." Republicans say the EPA and McCarthy failed to respond to several requests regarding transparency and her tenure as the EPA’s top air quality official. "As you know, all Republicans on our EPW committee have asked EPA to honor five very reasonable and basic requests in conjunction with the nomination of Gina McCarthy which focus on openness and transparency," the Republican senators wrote. "While you have allowed EPA adequate time to fully respond before any markup on the nomination, EPA has stonewalled on four of the five categories." "Because of this, no Republican member of the committee will attend today's markup if it is held," they continued. "We do not ask or expect that you will agree with this decision. We do ask and expect that you will follow the rules of the committee and the full U.S. Senate." Sen. David Vitter (R., La.) submitted more than 600 questions to the nominee. Republicans and conservative think tanks have accused the agency of stonewalling information requests, skirting public records laws by using private email addresses, and hiding its scientific data from public scrutiny. "This is not about policy, and Sen. David Vitter and the other Republicans on the committee understand this," said Christopher Horner, a senior fellow at the Competitive Enterprise Institute, in a statement. "To hear Democrats claim ‘obstruction’ when Republicans ask simply that EPA come clean before having one of its most secretive officials promoted really takes the cake." Horner and CEI have filed numerous Freedom of Information Act lawsuits against the EPA seeking communications from top EPA officials, including McCarthy. Horner’s research first revealed that former EPA administrator Lisa Jackson used a secret email address during her tenure, a practice that Republicans and watchdog groups said violated the spirit of the Freedom of Information Act. Subsequent emails released through CEI lawsuits revealed several other EPA officials using private email addresses to conduct government business. This entry was posted in Politics and tagged Congress, David Vitter, EPA, Gina McCarthy, Lisa Jackson, Obama Administration. Bookmark the permalink.